We are interested in why people become active in the movement, but then fail to follow through on the final desired action. You can imagine this as the stages of brand knowledge of an individual. If they make it all the way to the right-hand side, then they have become a customer and completed the purchase. There are a couple steps between not knowing of a brand and purchasing something from them. First, they must become aware of the brand. Some percentage of people who are aware of a brand might become interested in what it’s doing or selling. A percentage of the people who are interested will eventually come to a point where they are deciding whether to purchase from the brand. Then finally some of those who are actively deciding will purchase what you’re selling. The examples used here are intended for social enterprises that sell products, but the same concepts apply in advocacy and other methods of change making. The key aspect of this diagram is that between each stage there are people who don’t continue down the path. Your business likely has something similar, whether it is specifically drawn up or not. As people move from the left to the right there are always some who for some reason drop out of the funnel. Let’s start at the far right and examine what could go wrong in the moments before purchase. Picture this: You are on a website that you’ve been thinking about for a while and you have added a product to your cart. You hear a social media notification ping. You switch to the social media window and forget about the product in the cart on the shopping website. Later, you come back and close the window because you have too many tabs open. In this scenario, you have entered the decision-making section because you got to the point where you added a product to the cart, but you never completed the purchase, so you never passed into the customer category. Distraction is one of the easiest ways of explaining people who drop off the funnel. This is where re-targeting ads are an important tool in the marketing toolbelt, because there are people who are interested in what you’re selling, but just forgot to buy. Another major issue that can cause people to drop off at the decision-making phase is if the checkout process is too complicated. If you’ve ever been frustrated because you had to create an account before you could purchase, or if there was an error and you had to re-enter your shipping address one too many times and you quit, the checkout process was too difficult. Reducing the number of steps in the checkout process or improving the design of the checkout pages to make things clearer can reduce the impact of this problem. Another factor that can cause people to drop off at the decision-making point is if they choose to go to one of your competitors instead. This is a natural part of the decision process, and if you’re seeing a large drop off at this stage, you might want to see what your product or service is missing compared to your competition. You should also see if you are presenting your offer in an appealing way for people at each stage in the funnel so that they're prepared to buy your solution once they get to the decision phase. Next is the interested category. These are people who are interested in your brand and the kinds of things that you are selling but aren’t ready to purchase anything. These are people with whom your branding resonates and they like the values of the brand or the benefits that they get by following the brand. These are often people who read your blog, follow your social media, have signed up for your newsletter, or have engaged with your brand in person such as at an event. They care enough to listen to what you say, but you might not be selling something that they need, or maybe they’re not at the stage where they are ready to buy what you’re offering. Some of these people might be interested for years without buying in, and some of them will never buy in. People who are interested in what you’re doing might just be waiting for you to put out a new product that more closely meets their needs. They might be waiting until they have enough money that they feel comfortable spending it on what you’re selling, or they could be waiting for approval from a boss or spouse. Even though these people are not customers, they might still be very valuable for your brand. They are likely people who will share your social media posts or provide valuable feedback if they are offered a survey or beta trial. Then there are the people who are aware of your brand, but are not yet interested. These are people who have read a tweet in their feed, seen a billboard advertisement, heard a friend mention your brand or been to an event that was sponsored by your brand. They are generally aware of what your brand is, or what you do, but don’t know the specifics, and don’t know what your values are. If your company has a significant number of people who are aware of you, there is great potential in that. Studies have shown that it takes on average, a minimum of 7 contacts with a brand before they will consider purchasing. The people who are included in this section of the funnel are in a stage between the first contact and engaging with the brand. A significant part of this section’s drop off is because some people will discover fairly quickly that they don’t need what your business is selling. They might also disagree with something that your brand has released. If you are doing your branding effectively, this is expected and normal. To improve results of people who are aware, you can do more partnerships with influencers in the target markets that you’re marketing to. You can also try improving the messages on your company website so that people who are aware and searching for more information can quickly understand what your company is about. You can also try marketing to a different potential market that more closely aligns with your company values, product, or service. Many of the techniques that you would use to move people from being aware to being interested also work for giving people their first exposure and moving them from the target market into the aware category. 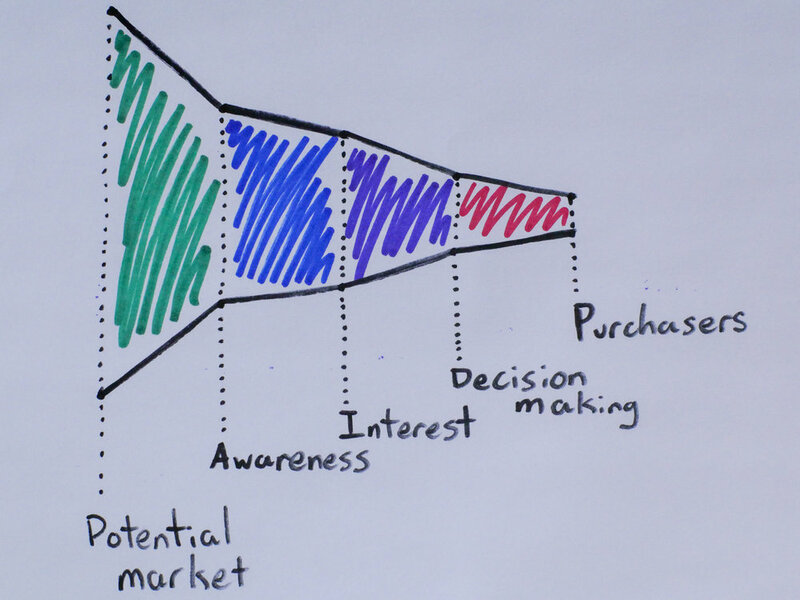 Now that you know what a marketing funnel is, why should you care? Here are two examples of possible marketing funnels. The one on the left is an example of an awareness campaign marketing funnel. The numbers were filled in using stats from the UK response to the ice bucket challenge. The potential market is 64.6 million, the 2014 population of the UK. Because the campaign went viral, we’ll assume that only 10% never heard about ALS and the ice bucket challenge. 11.0 million (17%) of UK citizens were interested enough to take part in the challenge, and 1.1million people donated overall. I’ve assumed that approximately 50% of people who took part actively decided whether to donate to the cause. In the end, the average donation across the UK was £5 pounds. So, which funnel is better? 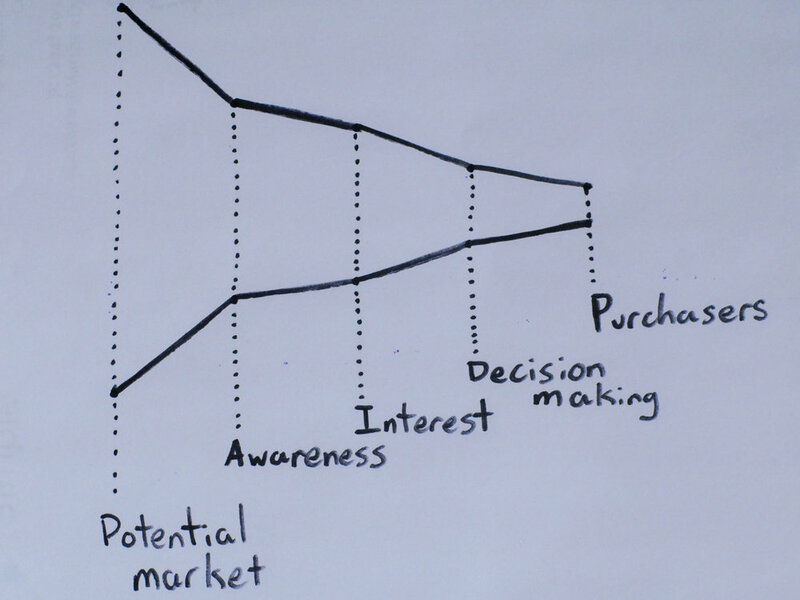 The awareness campaign funnel is great because of it’s absurdly large potential audience. This allows them to access nearly every individual in the country. One downside of this large target is that it loses the opportunity to tailor messages for people who are really engaged in issues of health and are the most likely to donate. There is a large drop off at the interested section. This is because nearly everyone has already heard of the issue and has decided whether they are interested. If this could be improved however, then they would have significantly improved results down the funnel. On the other hand, the other funnel is finely tuned for it’s target market and has the completely unrealistic assumption that 50% of people will pass through each stage. Even so, the end result is reasonable and only slightly above industry averages for online stores. 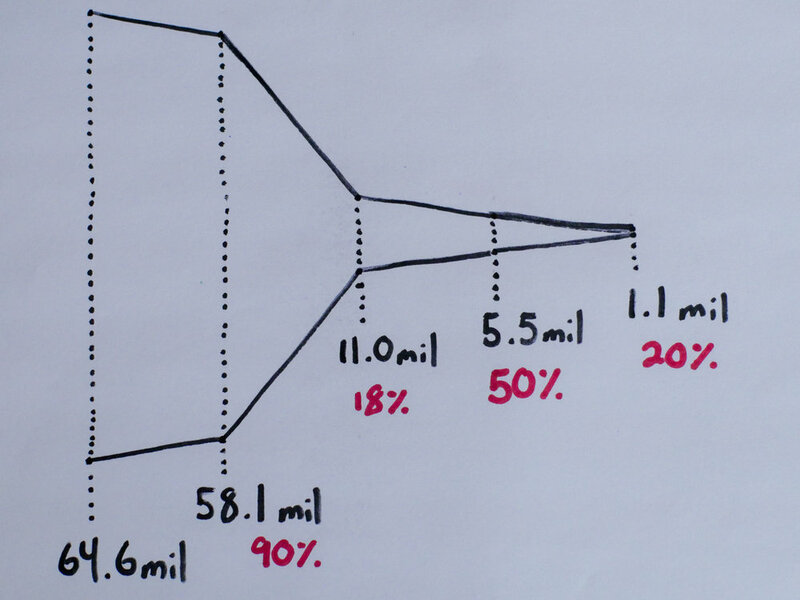 The difference is huge, as 6.25% of people who are within the target market will become customers within the targeted funnel, and only 1.62% of people in the awareness campaign will donate. Another significant difference is the level of engagement. With the fictional clothing store receiving 20x per customer, they make £3.1 million compared to the ice bucket challenge’s £5.5 million. Also, the clothing company only engaged a potential audience of 500,000 and could easily increase their reach to additional market segments to increase their revenues, but the ALS association would have already hit their maximum and would only be able to improve by trying to get more people interested in the challenge. This shows how marketing funnels are useful. You can examine where along the process people drop off, and you can work at improving the experience for those individuals or ask them why they didn’t continue. You can also see exactly where you need to focus your efforts on improving your marketing efforts, and whether you need increased visibility, or if you need to improve your internal processes. As you evaluate your social enterprise’s marketing funnel, keep it simple.